Scottish punk legends Skids blew the roof off The Waterfront, Norwich on Friday night (19th Jan) playing to a packed out venue. The band, led by charismatic frontman Richard Jobson, have been on a non-stop tour around the UK celebrating 40 years of Skids. And tonight proved they are still at their best. Engaging with the crowd from the get-go, they opened with a new track from their latest record Burning Cities, This Is Our World. One of many politically charged anthems on the setlist, but also from their new record like One Last Chance and World on Fire, segmenting Jobson’s passionate tirade against Donald Trump. Their new record debuted in the Top 30 of the Official Album Chart on Friday, and it’s clear to see why with the whole room chanting back the lyrics and jumping around to the new tracks. As ever with a Skids set, the classics proved to be the most popular, The Saints Are Coming and the set closer Into The Valley got the best reception on the night, as well as the as relevant as ever Working For A Yankee Dollar. With his absolutely atrociously good dancing and great showmanship, it’s easy to pick Jobson as one of my favourite live frontmen. Not to forget his great tales from the past on how the band formed, their time on Top of the Pops and being introduced by THAT presenter and also how we should all kill Leo Sayer for beating the band in getting the No.1 spot in the Independent Album Chart. Though no credit should be taken away from the other members of the band. Big Country’s Bruce Watson was as always his positive, cheery self on guitar, alongside son Jamie who looked in his element throughout. Bassist Bill Simpson and drummer Mike Baillie were also at their best during their hit-packed set. Midway through, as ever, a small tribute to the late Stuart Adamson, a founding member of the Skids, made The Waterfront erupt with chants of ‘Stuart!’ and warm applause. Support for the band came in the shape of Watford’s The Spitfires. The five-piece rockers flowed through a thirty-minute slot with ease. Their lead singer had an interesting swagger about him, reminding me of a mixture of Paul Weller and Richard Ashcroft. They’ve only recently released a new track Over and Over Again, you should check it out before they hit the big time, because based on this performance, they will be soon! All in all, a great night of music. 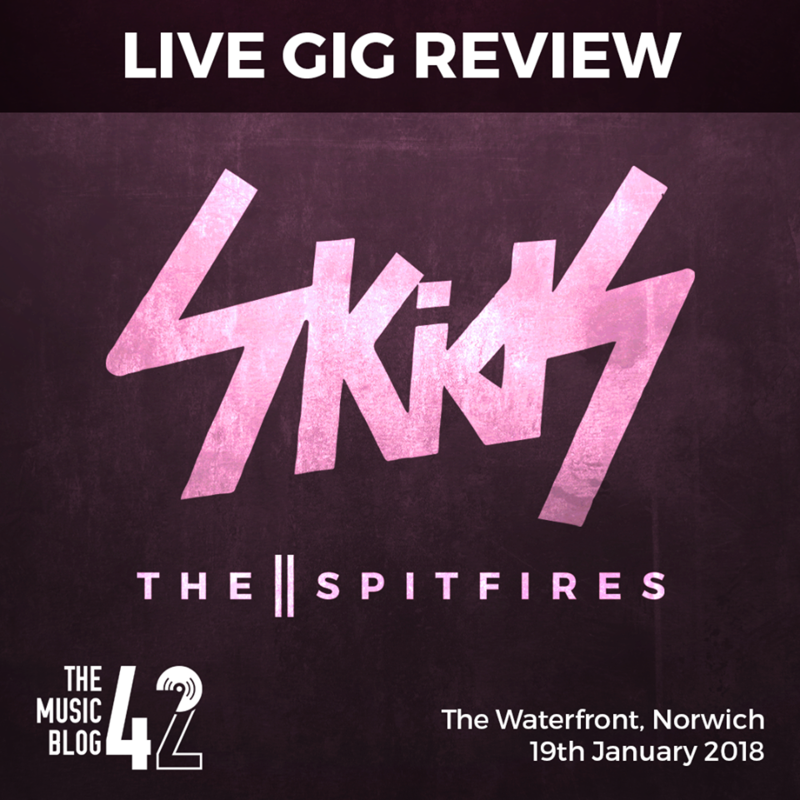 The Spitfires were brilliant and are definitely a band to keep an eye out for, but Skids were top drawer and with the band still on tour until late June, make sure you catch them for one of their remaining tour dates because as a live band, they are the benchmark.